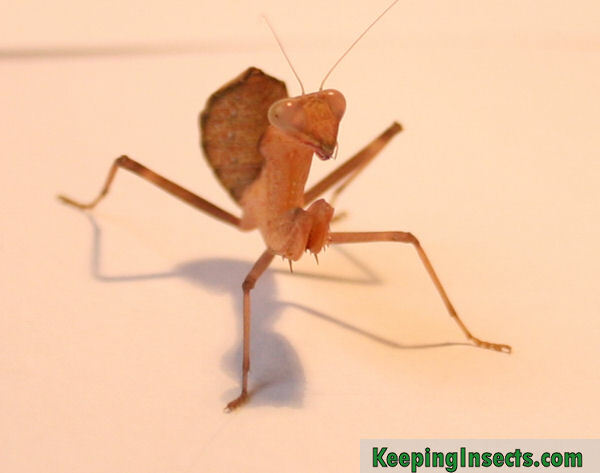 The African Mantis, or more specific and scientific Sphodromantis lineola, is a large and fierce species of mantis. It is commonly kept as a pet because of its size and fierce hunting techniques and its relatively easy care. Her natural habitat lies in sub-Saharan Africa. 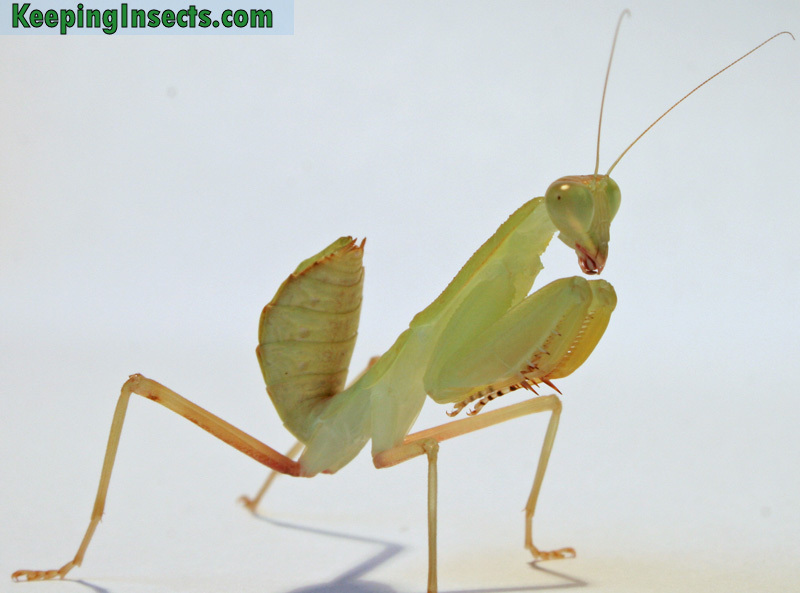 This species of praying mantis is usually green, but there are also beige and brown varieties. The difference in color is mainly due to the environment in which the animal is kept. The brown varieties can have beautiful purple eyes as can be seen on the pictures on this page. 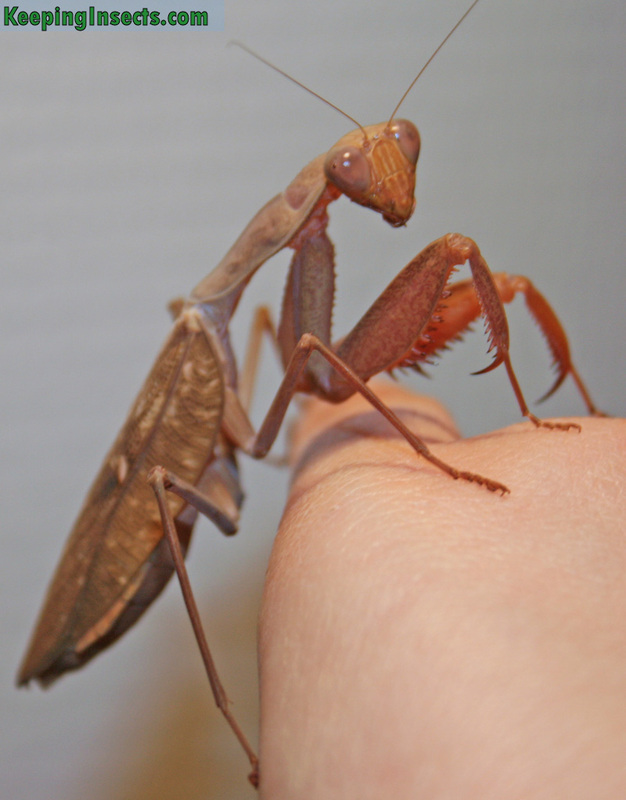 This is one of the larger species of praying mantis that is being successfully kept in captivity. The females are about 8 cm long, the males are a bit smaller with 6 to 7 cm. The males are thinner with wings that are slightly longer than their body. The females are larger, with wings that extend just to the end of the abdomen. On their wings they have a yellowish dot. A nymph of Sphodromantis lineola in the brown variety. 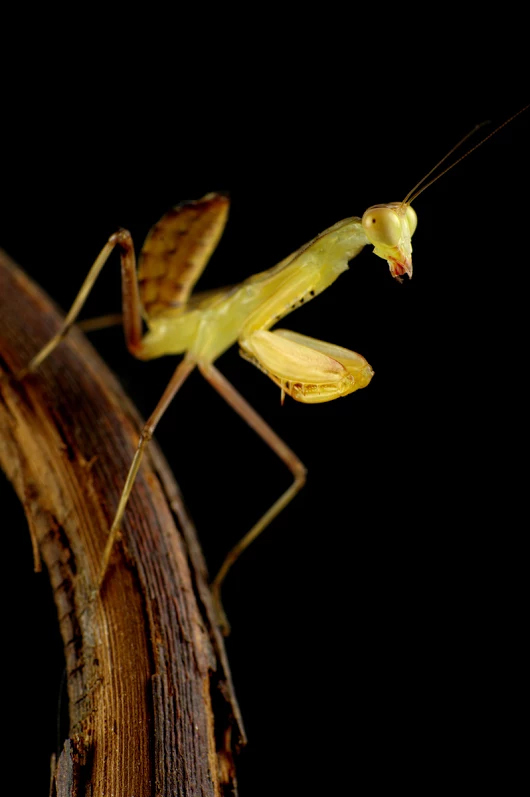 Sphodromantis lineola is a fierce kind of praying mantis. She will actively chase prey once she has spotted it. Females can handle very large prey. Males can sometimes be a bit intimidated by VERY large prey such as locusts, so it is better not to give them extremely large prey. When the adults of this species feel threatened it may raise its wings and move its front arms sideways to expose an orange colored area. The ideal temperature is about 25 ° C, but a temperature between 22 and 30 ° C is perfect too. At night the temperature can be allow to drop, but it should be at least 17 ° C to ensure proper development. When exposed to temperatures below 5 ° C the mantis may not survive. 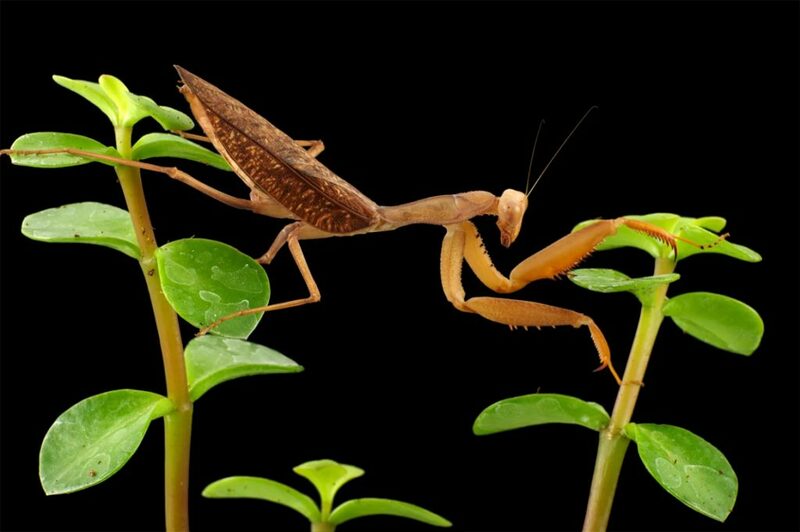 This species does not have high demands on the humidity, but it is important to spray about 2 times a week to allow the mantis to drink. A target air humidity is about 50% – 60%. 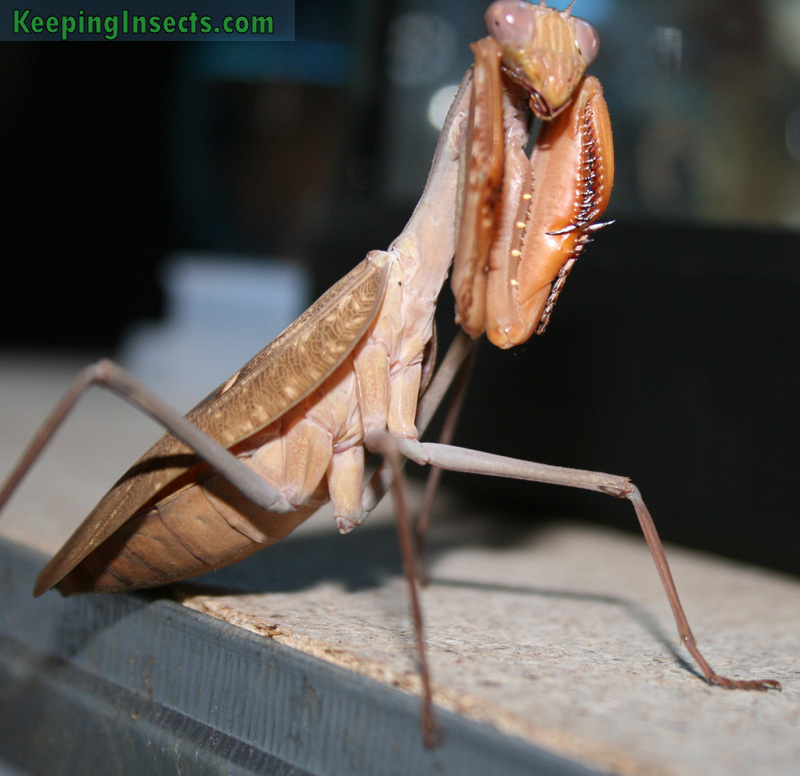 As with all species of praying mantids, this species needs a cage that is at least 3 times the length of the animal in height, and at least 2x the length of the animal in width. For an adult this means is at least 24 cm in height and 16 cm in width. A nice size for a terrarium would be 30 x 20 x 30 cm (hxwxd), so there is room for lots of fake plants and perches. Because Sphodromantis lineola is such an active predator, group housing is not succesfull. Sooner or later only one will be left in the enclosure, because it ate all the others. Young nymphs are less cannibalistic than older ones, so nymphs that are L4 or younger can be kept together when ample space and food is provided. 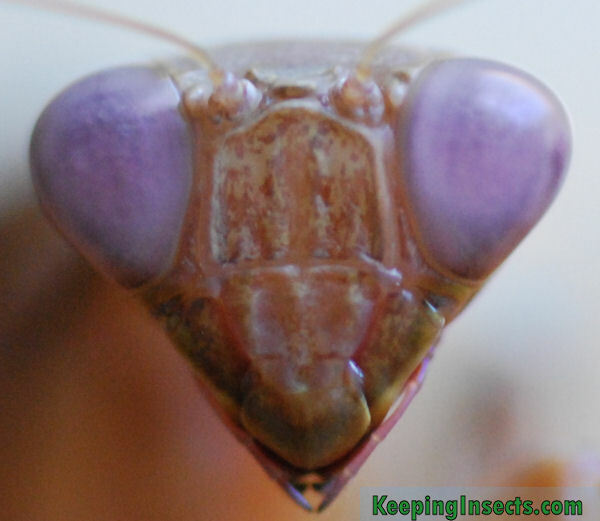 Head of a Sphodromantis lineola in the brown variety with purple eyes. The adult females of this species bigger and heavier than the males. The difference between males and females can be seen from L4, as the sexes have a different number of segments on their abdomen. 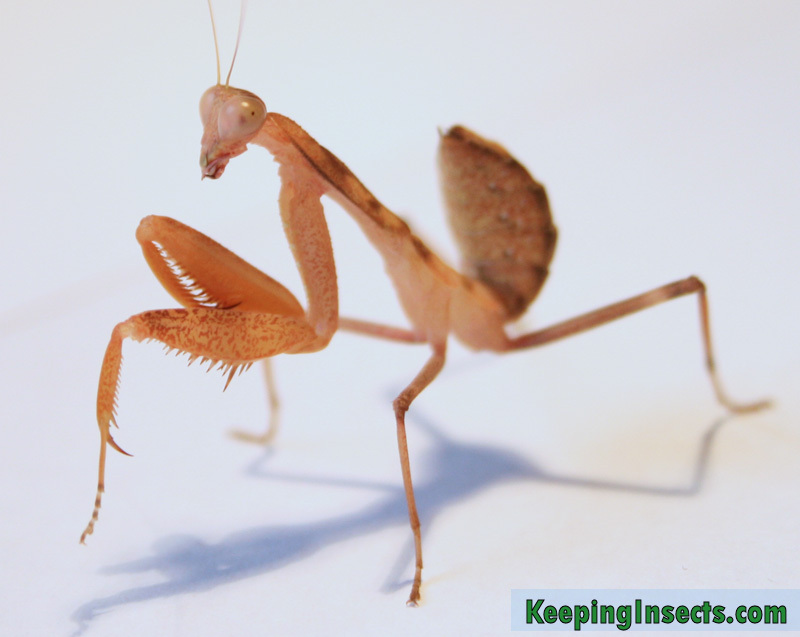 Approximately 2 to 4 weeks after the last molt, in which the mantis becomes adult, a mating attempt could be made. Make sure that the female eats very well before you put the male in her enclosure. The female can be very aggressive to the male. (To read more about mantis mating and keeping the male alive, read this) Mating can take several hours, the male must subsequently be removed from the residence if you want him to live.